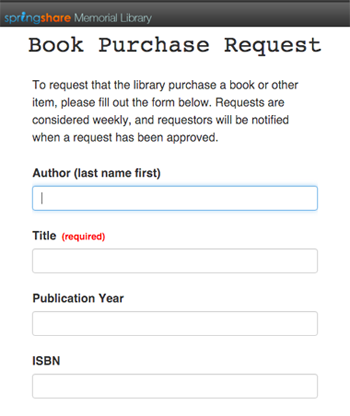 Feedback and Assessment Tools for Your Library in One Fully Featured, Secure Package. Whether you need to effortlessly create various forms and surveys to embed in your library website or build gradable quizzes and interactive, self-paced tutorials… LibWizard has your needs covered. Promote 24/7 learning that occurs anywhere, on any device. Self-paced learning tutorials ensure that users walk away with a learned skill and accomplished task. With LibWizard Tutorials, students become expert library users and researchers. Embed your catalog, databases, courseware tool, etc. alongside helpful instructions, quiz questions, and more. Interactively guide users to master the subject. Two-way integration makes it easy to promote LibGuides inside your LibWizard tutorials and vice versa. 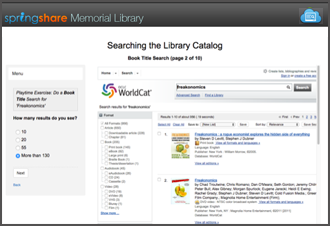 Make LibGuides a one-stop shop for all content. Our content builder helps you better engage users with a variety of interactive media options. Embed streaming videos, text, PDF, images, widgets, and more. Share explanations on correct & incorrect responses so users can asses their knowledge as they progress through content. Fourteen question options ranging from single line-text, multi-line feedback, checkboxes, rating, file upload, and more! Password-protect your tutorials and optionally limit visibility to specific date-ranges. Optionally encrypt responses in the database. Meet your formative assessment goals and pair quizzes with instruction efforts. Quickly and easily assess learning and gain immediate insight into user understanding. Instant feedback options allow users to immediately see if their actions meet the target. Designate the correct answer for each question and the system will automatically grade each new entry. We'll even email you the results! Set a time limit for finishing the quiz and control access to the previous button. Highlight correct and incorrect answers, customize the columns that display, filter the results, and drill down to individual quiz submissions. 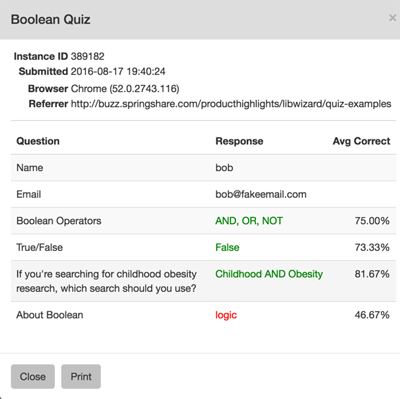 Embed quiz content into courseware packages via the LTI connector and optionally encrypt data and responses for additional security. Streamline workflows and route all internal and external feedback into one form management area. Create an unlimited number of forms and gather an unlimited number of responses. Bottom line: ask all the questions you want, to get the data you need. Predefine field types for input control. Skip logic and if-then handling. Email submissions to designated users. Mobile-friendly so users can fill out forms on mobile devices. APIs help advanced users with task automation. Question bank for reusing form elements. Surveying users is the heart of any customer-centric organization. Use the Survey Wizard to quickly create surveys and gather invaluable feedback. Quickly build surveys by pulling questions from an admin-controlled question bank. Additionally reuse any question from any form, survey, quiz, or tutorial – system-wide. 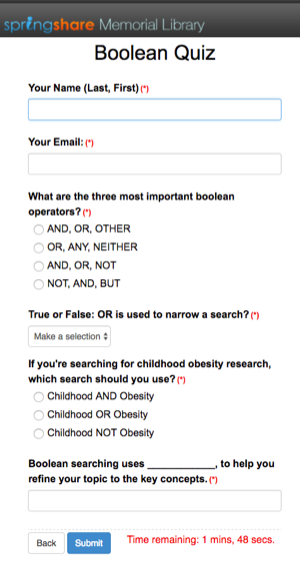 Set up your survey to reveal specific questions based on answers that a patron provides. Ensure a strong response rate and hide irrelevant questions, keeping your users engaged. Dedicated Welcome and Thank You screens enable you to customize surveys and provide additional information to the survey takers. Optionally encrypt user responses and store securely in the database. All survey content and responses are transmitted using the https secure protocol. All four LibWizard components feature advanced statistics and analysis tools enabling you to quickly sort and categorize patron submissions. Advanced filtering options to slice and dice your submission data. Filter by date to see all results from a specified time-period. Download beautiful charts and graphs for reports. Create and save visual charts on your field questions. Run cross-variable analysis with integrated cross-tab reporting. Export all data to Excel via CSV format. Optionally collect user IP, referrer URL, and browser data. Auto-grading functionality for Quiz reports. Springshare's flexibility in meeting needs of a variety of populations and bridging service failure areas…plus being able to bet on and try ideas instantly, creates an agile environment. LibWizard Lite is a version of LibWizard containing Forms Wizard and Surveys Wizard only. LibWizard Lite comes FREE with LibGuides CMS. If you are interested in upgrading to the full LibWizard package contact us and we'll enable a trial for you asap. Insert LibWizard created forms into your LibGuides or LibGuides CMS powered website. Send satisfaction surveys automatically with LibAnswers tickets and user interactions. 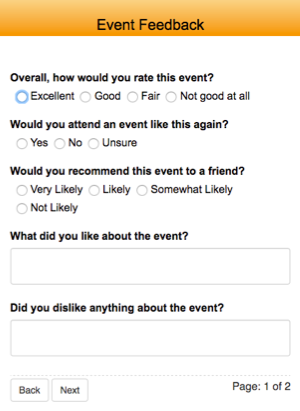 Follow up with users who attended LibCal Events and email post-event surveys and feedback. Embed Quizzes and Assessments inside LibGuides for an integrated Information Literacy approach. Associate LibWizard surveys with LibCRM user profiles for a deeper insight into your user's preferences and feedback. Springshare is Going to ACRL!